What some of us once recognized as the “pound” sign on a phone has in the digital age taken on a new renowned identity—the hashtag. To those who are unfamiliar, it may appear as just a confusing and unnecessary symbol before a word or phrase, for example #imconfused. However, the power behind the “#” symbol can be immense, as its purpose is to serve as a connector for similar content in the social media world. 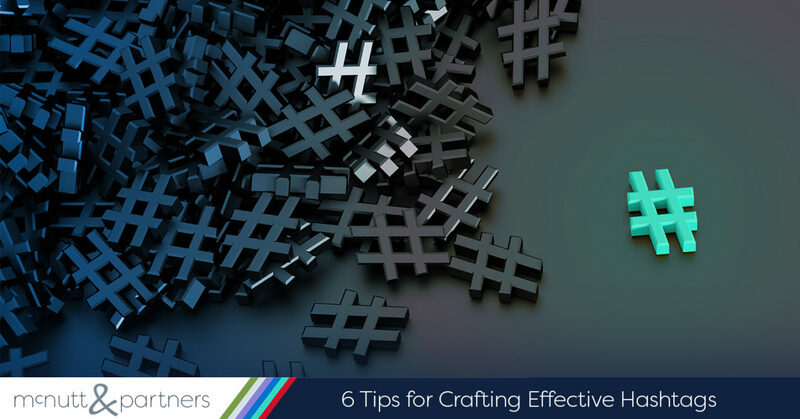 Crafting effective hashtags is somewhat of an art, but it doesn’t have to be difficult if you do not overcomplicate the process. As a quick review, the “hash” sign before a word or phrase turns that word or phrase into a searchable link on social media. The link will take you to a grouping of posts that used the same or similar hashtag—in essence, bringing you into a global conversation about that topic that spans the social media realm. The widespread use of the hashtag began on Twitter, but it has since spread to other social media platforms like Facebook and Instagram. Its use has become significant, especially in terms of current events and news reporting—those topics that are deemed “trending” when multiple social media users are discussing them. How can a hashtag help my business? Hashtags can also be useful when establishing an identity for your brand on social media. For one, a company hashtag will prompt potential customers to make a visual association with your brand, simply by them seeing the phrase “#EatAtEds,” for example. In addition, by their function, using a brand hashtag on all of your social media posts will make them more easily searchable for users since they will all be grouped together in one place. How do I go about crafting effective hashtags? Hashtags afford you the freedom of creativity, but there are still certain qualities that make an effective hashtag, effective. Use these tips when devising a brand hashtag for your business, or when adding multiple to your social media posts. Keep it brief, but catchy. When considering the anatomy of a hashtag, it’s important that you keep it relatively succinct. An effective hashtag can be a few words put together, but it should not be enough words to create an entire sentence. For example, #ithinkthishashtagistoolong is a jumbled mess. However, #ShortButSweet has a nicer ring to it, and it’s easier to read. In fact, the most-used hashtag ever is just one word: #love. Another element of catchy hashtags is the use of alliteration, which happens when two or more words are placed next to one another that start with the same letter. For example, #FunFactFriday and #ThrowbackThursday are a couple of commonly-used hashtags that employ alliteration well. Make it relevant. Your hashtags should be relevant to your business, and when possible, relevant to trending topics. Relevant to your business sometimes means incorporating your business name or initials into the hashtag itself, but it doesn’t have to (compare #MomentumWithMcP to #advertisingmomentum). Sometimes a hashtag can be more effective when you do not mention your name specifically. In addition, if there is a trending topic going on in your area or worldwide, you can use a hashtag to connect your brand with it. For example, we could use #McPForAU, indicating support for Auburn University competing in the SEC championship (currently relevant at the time this blog was written). Making your hashtags specific is best for reaching a more targeted audience. Play on emotions. Whether you’re evoking humor, sympathy, reflection or something else, crafting effective hashtags means playing on human emotions. Doing so will not only capture their attention, but it will help you leave a lasting impression on your users. For example, Digiorno Pizza’s hashtag #DiGiorNOYOUDIDNT used humor to showcase the brand’s comical side, leading to a string of Tweets that employed the hashtag as their main focus. Use event hashtags. A hashtag can be effective when created specifically for an event or campaign that your business is hosting, participating in or sponsoring. You can use it in promotional materials leading up to the event, as well as encourage customers to use the hashtag in their own photos of the event. This makes it fun for your customers and gives them the sense of being part of something bigger. If it’s an event you hold every year, you can consider including the year of the event in the hashtag to allow people to reference a specific point in time. Your event hashtag can also encourage action. Consider Lays’ hashtag #DoUsAFlavor, used in its annual consumer-inspired flavor creation contest. Make sure it’s original. So you’ve come up with a creative hashtag—great! Now you need to make sure you aren’t the only one who has had the same clever idea. The last thing you want is to start advertising a hashtag for your power equipment business, for example, that is actually already being used by a gym or energy drink brand. Cater hashtags to your social network. Some social networks are naturally more hashtag-heavy than others. Users are generally more tolerable of multiple hashtags on Instagram than they are on Twitter, and more on Twitter than they are on Facebook. The general rule of thumb that we use for our clients is that Instagram posts with at least 11 hashtags get more engagement, Twitter posts with two to three hashtags get more engagement and Facebook posts with one or no hashtags get more engagement. The hashtag dialect can seem like a complex one upon first glance, but it’s actually an interesting example of how our language is evolving. Even in verbal communication, people are now frequently saying out loud “hashtag _____” as a way to sum up their thoughts on a situation. Mastering the art of crafting effective hashtags can ultimately be game changing for a business looking to take off in the social media world. Need help honing your best hashtag? Contact the McNutt & Partners team today at 334-521-1010 or visit our contact page!